This advanced liposomal retinol complex is a powerful tool for anyone interested in improving skin tone, texture, pores, fine lines, wrinkles & the skin’s general appearance. Retinol is one of the most researched and proven skincare ingredients for anti-ageing, pigmentation, pore control & acne. It acts to stimulate increased skin cell turnover and makes the skin behave like a younger, healthier skin. 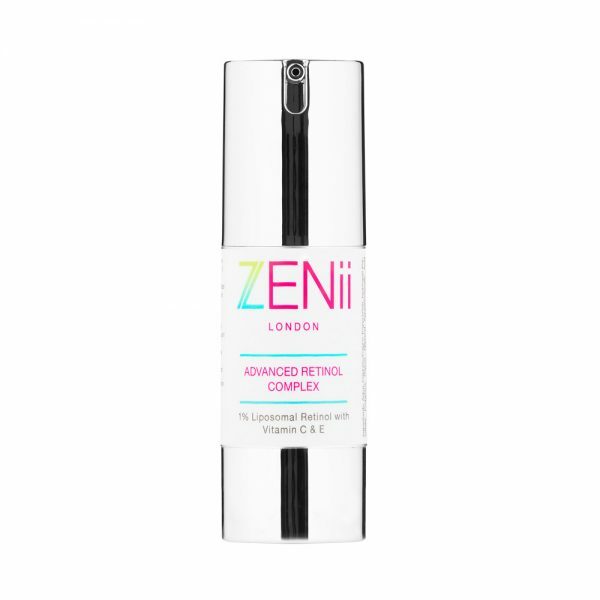 ZENii Advanced Retinol complex utilises the latest microencapsulation and liposomal technology to ensure deep delivery and effectiveness. It is a light weight 1% microencapsulated slow release retinol serum with added vitamin C & E. Together Vitamin A (Retinol), Vitamin C & Vitamin E form the most powerful and effective anti-ageing skin ingredients. Retinol is highly unstable in the presence of light and air. Mircoencapsulation of our retinol ensures that the active molecule is protected and preserved. It also facilitates controlled, slow release of the retinol and enhanced penetration through the lipid barrier of the skin. This protects the retinol from oxidation & degradation and helps maintain a stable shelf life. Microencapsulation helps to reduce skin irritation compared to non encapsulated retinols so you will find our retinol much easier to use and less irritating. All retinols can increase photosensitivity of the skin so they must be used in conjunction with sun safety e.g. use antioxidant serums & sun protection (SPF) whilst on any kind of Vitamin A/Retinol regime. Advanced retinol complex is powerful formula that contains 1% liposomal retinol for improved delivery to the skin. It is a great tool for anyone looking to improve their skin, diminish the appearance of fine lines or prevent acne & congestion. It is clinically proven to improve the skin’s texture, firmness and tone and will help reduce pigmentation irregularities as well as help control skin congestion & blemishes. Advanced retinol complex has been formulated so that it can be mixed with your ZENii night cream or eye cream to give them a boost. You can use it a little bit like interval training. Mix it a few nights a week into your ZENii night cream or eye cream and stimulate your skin to rejuvenate and repair. Alternatively it can be used as a stand alone product a few nights a week as part of your general skincare routine. Our advanced retinol is micro-encapsulated and blended with vitamin C and Vitamin E for ultimate penetration and efficacy. Retinol is highly unstable in the presence of light and air. Micro-encapsulation of our retinol ensures that the active molecule is protected and preserved. It also facilitates controlled, slow release of the retinol and enhanced penetration through the lipid barrier of the skin. This protects the retinol from oxidation & degradation and helps maintain a stable shelf life. Microencapsulation also causes less skin irritation compared to non encapsulated retinols. We are passionate advocates of science based skincare and this retinol complex is one of the finest. Why use a toner? Toners help to remove debris from the skin after cleansing. They are formulated to remove oil, dirt, grime, makeup, dead skin cells and help restore the skin’s natural pH. Toners help prepare your skin for the day or night ahead by allowing your products to penetrate more deeply. Your skin is your main immune barrier between the outside world and you – using antioxidant toners can neutralise potential free radical damage and limit the ageing process. Use twice a day after cleansing for best results. Mix 1/2 to 1 pump of retinol complex into your ZENii micronutrient night cream on nights when you want to stimulate the skin. Start slowly eg. every 3rd night and slowly increase usage as the skin tolerates it. PM only. Mix 1/4 to 1/2 pump into your ZENii revitalising eye cream when you want to boost the anti-ageing capacity of your eye cream. Start slowly e.g. every 3rd night and slowly increase usage as the skin tolerates it. PM only. Mix 1/2 pump into ZENii hand & nail cream for an extra anti-ageing boost. Start slowly e.g.every 3rd night and slowly increase usage as the skin tolerates it. PM only. Retinol complex can also be used as a stand alone product. Use 1 pumps onto the face at night and increase usage as the skin tolerates it. PM only. Start slowly. Avoid going to close to the crease of the nose and to the lips. Caution: Advanced Retinol Complex is strong and will cause redness, irritation, itching and shedding of the skin initially. This is to be expected with all forms of retinol. Generally these skin symptoms settle down with continued usage but some people do not tolerate retinols well and will have persisted or severe skin irritation. If your skin becomes very irritated then stop all retinol and active products (salicylic & glycolic acids etc) and only restart when the skin has settled. Seek Medical advice if needed. Mix 1/2 pump into your ZENii revitalising eye cream when you want to boost the anti-ageing capacity of your eye cream. Start slowly e.g. every 3rd night and slowly increase usage as the skin tolerates it. PM only. Caution: Advanced Retinol Complex is strong and will cause redness, irritation, itching and shedding of the skin initially. This is to be expected with all forms of retinol. Generally these skin symptoms settle down with continued usage but some people do not tolerate retinols well and will have persisted or sever skin irritation. If your skin becomes very irritated then stop all retinol and active products (salicylic & glycolic acids etc) and only restart when the skin has settled. Seek Medical advice if needed.